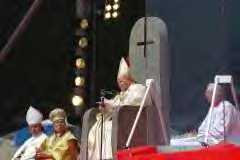 Roman Catholicism -Christian or Pagan? Prior to the time of Constantine's "conversion," Christians were persecuted not so much for their profession of faith in Christ, but because they would not include pagan deities in their faith as well. Then, with Constantine's emphasis on making his new-found Christianity palatable to the heathen in the Empire, the "Christianization" of these pagan deities was facilitated. For example, pagan rituals and idols gradually took on Christian meanings and names and were incorporated into "Christian" worship (e.g., "saints" replaced the cult of pagan gods in both worship and as patrons of cities; mother/son statues were renamed Mary and Jesus; etc. ), and pagan holidays were reclassified as Christian holy days (e.g., the Roman Lupercalia and the feast of purification of Isis became the Feast of the Nativity; the Saturnalia celebrations were replaced by Christmas celebrations; an ancient festival of the dead was replaced by All Souls Day, rededicated to Christian heroes [now Halloween]; etc.). A transition had occurred -- instead of being persecuted for failure to worship pagan deities, Christians who did not agree with the particular orthodoxy backed by the Emperor were now persecuted in the name of Christ! "Christianized" Rome had become the legitimate successor of pagan Rome! This is the sad origin of the Roman Catholic Church. 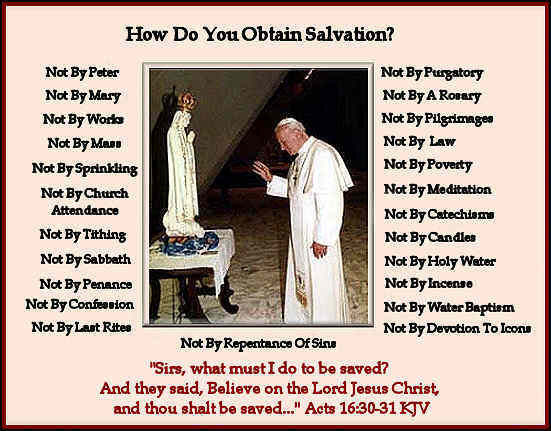 Below are the highlights of what Catholics believe concerning their source of authority; God, Christ, and Mary; salvation and the sacraments; and heaven and hell. So much more could be said concerning not only the items listed below, but also concerning other areas of Catholic teaching (such as the claims of the Roman priesthood and its supposed origin in the Apostles; the nature of the pope's alleged infallibility and the supposed origin of his office in the Apostle Peter; the nature of the Confessional; the doctrine of penance/indulgences; practices concerning rituals, ceremonies, and relics; the doctrine of Celibacy; policies on marriage and divorce; the role of the parochial school; etc.). Excellent reference sources for a thorough treatment of Catholicism’s origins, beliefs, and practices would be Roman Catholicism (466 pgs.) and A Woman Rides the Beast (544 pgs.). 1. Source of Authority. With respect to the Bible, Catholics accept the apocryphal books in addition to the 66 books of the Protestant Bible. They also accept tradition and the teaching of the Catholic Church as authoritative and at least equal to that of the Bible (cf. Mk. 7:8,9,13; Matt. 15:3,6,9; Col. 2:8). With respect to papal infallibility, Catholics believe that ecumenical councils of bishops and the pope are immune from error when speaking ex cathedra about faith and morals (i.e., "from the chair" -- by sole virtue of position or the exercise of an office). (And by "infallible," Catholics mean much more than merely a simple, de facto absence of error -- it is positive perfection, ruling out the possibility of error. In actuality, Roman Catholicism places itself above Scripture; i.e., it teaches that the Roman Catholic Church produced the Bible and that the pope is Christ's vicar on earth. Catholics also maintain the belief in sacerdotalism -- that an ordained Catholic priest has the power to forgive sins (cf. 1 Tim. 2:5). This of course is a false teaching because no one can forgive sin other then God Himself (Mark 2:7). The Word of God is the ONLY true source of truth, not church tradition. 2. Jesus Christ. Catholicism teaches that Christ is God, but they, nevertheless, do not believe that Christ's death paid the full penalty for sin; i.e., they believe that those who qualify for heaven must still spend time in purgatory to atone for sin (cf. John. 19: 30; Hebrews 10:11,12). There is nothing taught in the Bible about purgatory. Catholics diminish Christ's deity (as do other cults), but in a different manner; instead of bringing Christ low by denying his deity, Catholics elevate Mary high in an attempt to make her equal with Christ, this is heresy. 3. Mary. 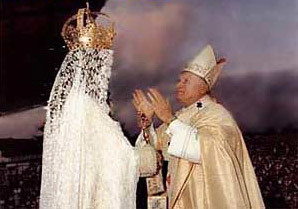 The Catholic Church gives honor and adoration to Mary that the Scriptures do not; she is readily referred to as "holy," the "Mother of God," and has been dubbed the "Co-Redemptrix," thereby making her an object of idolatrous worship (e.g., the rosary has ten prayers to Mary for each two directed to God). In 1923, Pope Pius XI sanctioned Pope Benedict XV's (1914-1922) pronouncement that Mary suffered with Christ, and that with Him, she redeemed the human race. And Pope Pius XII officially designated Mary the "Queen of Heaven" and "Queen of the World." Catholics claim not only that Mary was perfectly sinless from conception, even as Jesus was (doctrine of Immaculate Conception, proclaimed by Pope Pius IX in 1854), but that the reason she never sinned at any time during her life was because she was unable to sin (cf. Luke 1:46,47; Rom. 3:10,23; 5:12; Heb. 4:15; 1 John 1:8,10). Catholics also believe that Mary was a perpetual virgin (cf. Ps. 69:8; Matt. 1:24,25; 13:54-56; Mk. 6:3; John 7:5), and that she was assumed, body and soul, into heaven (doctrine of Assumption of Mary, declared ex cathedra by Pope Pius XII in November of 1950 -- that Mary was raised from the dead on the third day after her death, and anyone who refuses to believe this has committed a mortal sin). The consequence of all this veneration of Mary, in effect, establishes her authority above Christ's -- Rome says, "He came to us through Mary and we must go to Him through her." All this is so obviously idolatrous, one wonders why Catholics take offense when their religious affections are called cultic. Exodus 20:4,5 (the Ten Commandments) strictly forbids bowing down to any likeness of anything in heaven (this includes Mary). It's the 2nd command, read it for yourself! It's the same Scripture found in the Catholic Bible, so why do they disobey God? 4. Salvation. Catholics teach that a person is saved through the Roman Catholic Church and its sacraments, especially through baptism; they do not believe that salvation can be obtained by grace through faith in Christ alone , but that baptism is essential to salvation. Catholics believe that no one outside the Catholic Church can be saved ( Unum Sanctum ) (cf. John 5:24; Ephesians 2: 8,9; Galatians 2:21; Romans 3:22,23). They also believe that one's own suffering can expiate the sin's of himself and of others, so that what Christ's suffering was not able to achieve, one can achieve by his own works and the works of others (Vatican II). These are all lies of the Catholic church! The thief on the cross was never baptized. The Apostle Paul said Jesus had not sent him to baptize, but to preach the gospel (1st Corinthians 1:17). Jesus didn't baptize (John 4:2). 5. Sacraments. Catholics have seven sacraments: baptism, confirmation, Eucharist (mass), penance/reconciliation (indulgences), extreme unction (last rights), marriage, and orders (ordination). Although not even formally decreed until the Council of Florence in 1439, the Council of Trent later declared all to be anathema whom do not hold Rome's position that it was Christ Himself who instituted these seven sacraments! (The idea behind the sacraments is that the shedding of Christ's Blood in His death upon the cross is of no value unless it is somehow dispensed and applied "sacramentally" by the Catholic priesthood.) Although Catholics believe that the first five sacraments are indispensable for salvation (because without any one of them, a mortal sin has been committed), baptism is considered the most important. Catholics believe that a person enters into the spiritual life of the Church through baptism; i.e., baptismal regeneration -- that a person can be saved through baptism (actually, 'on the road to salvation,' because Catholics never know exactly when they are saved). They practice infant baptism because they believe baptism erases original sin (cf. John 3:18). Titus 3:5 makes clear that we cannot be saved by works, "Not by works of righteousness..." There are NO sacraments taught in the Bible. Nothing is essential for our salvation other than simple child-like faith in the Lord Jesus Christ as personal Saviour to forgive our sins. 6. The Mass. Unknown in the early church, the mass did not become an official doctrine until pronounced by the Lateran Council of 1215 under the direction of Pope Innocent III, and reaffirmed by the Council of Trent. 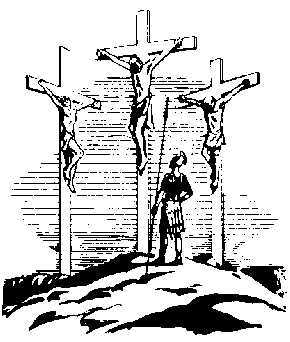 The Church of Rome holds that the mass is a continuation of the sacrifice that Christ made on Calvary -- in effect a re-crucifixion of Christ over and over again in an unbloody manner (cf. Hebrews 9:22; 1 John 1:7). They believe that by this means Christ offers Himself again and again as a sacrifice for sin (cf. Hebrews 7:27; 9:12,25,26; 10:10,12,14,18), and that this sacrifice is just as efficacious to take away sin as was the true sacrifice on Calvary. Catholics thus teach the doctrine of transubstantiation (meaning a change of substance) -- that the bread and wine (at communion) actually become (by the power of the priest!) the body and blood of Christ, which is then worshiped as God Himself! Indeed, the sacrifice of the mass is the central point of Catholic worship, as evidenced by the fact that those abstaining from attending mass are considered to have committed a mortal sin. Of course, holy communion is not taught in the Bible. The Bible teaches the "Lord's supper" which was simply an ordinance that Christ initiated for believers to do in remembrance of Him, no more. There is nothing magical about the Lord's supper. Nothing changes into anything. It is simply a time to remember Christ in an official church manner, Jesus is NOT dying again. The book of Hebrews tells us repeatedly that Jesus died "once" for all. 7. Purgatory. Of pagan origin, the Roman Church proclaimed purgatory as an article of faith in 1439 at the Council of Florence, and it was confirmed by Trent in 1548. The Catholic Church teaches that even those "who die in the state of grace" (i.e., saved and sins forgiven) must still spend an indefinite time being purged/purified (i.e., expiated of sins/cleansed for heaven). Technically, this "purging" can occur in this life rather than in purgatory itself, but as a practical matter, purgatory is the best the average Catholic can hope for. Some Catholics will admit that the doctrine of purgatory is not based on the Bible, but on Catholic tradition (which, by Catholic standards, is equally authoritative) (cf. John 5:24; Luke 23:43; 1 John 1:7,9; Phil. 1:23). (Others teach that it is based upon the interpretation of several Scriptural texts -- 1 Corinthians 3:15; 1 Peter 1:7; 3:19; Matt. 12:31.) They teach that those in purgatory can be helped by the prayers and good works of those on earth (which would include the "purchase" of masses and/or other indulgences), but they are not certain how these prayers and works are applied (cf. 2 Peter 1:9; Hebrews 1:3; John 3:18; 19:30; 2 Corinthians 5:6-8). (i) The Mass as a propitiatory offering. (b) Confirmed Unum Sanctum (no salvation outside of the Catholic Church). (c) Established 20 complex rules concerning when and how any indulgence may be obtained, and condemned "with anathema those who say that indulgences are useless or that the Church does not have the power to grant them ... [for] the task of winning salvation." If any one shall deny that the body and blood together with the soul and divinity of our Lord Jesus Christ, and therefore entire Christ, are truly, really, and substantially contained in the sacrament of the most holy Eucharist; and shall say that He is only in it as a sign, or in a figure, or virtually -- let him be accursed (Canon 1). If any one shall say that the substance of the bread and wine remains in the sacrament of the most holy Eucharist, together with the body and blood of our Lord Jesus Christ, and shall deny that wonderful and singular conversion of the whole substance of the bread into the body, and of the whole substance of the wine into the blood, the outward forms of the bread and wine still remaining, which conversion the Catholic Church most aptly calls transubstantiation -- let him be accursed (Canon 2). If any man shall say that Christ, the only begotten Son of God, is not to be adored in the holy sacrament of the Eucharist, even with the open worship of latria, and therefore not to be venerated with any peculiar festal celebrity, nor to be solemnly carried about in processions according to the praiseworthy, and universal rites and customs of the holy Church, and that he is not to be publicly set before the people to be adored, and that his adorers are idolaters -- let him be accursed (Canon 6). If anyone shall say that the ungodly man is justified by faith only so as to understand that nothing else is required that may cooperate to obtain the grace of justification, and that it is in no wise necessary for him to be prepared and disposed by the motion of his own will ... let him be accursed (Canon 9). If anyone shall say that justifying faith is nothing else than confidence in the divine mercy pardoning sins for Christ's sake, or that it is that confidence alone by which we are justified ... let him be accursed (Canon 12). These traditions which began at the Council of Trent are all heresies, NOT based upon the Word of God! Catholicism is a pagan religion, far far from the truth of God's Word. They have churchianity without Christianity!